Editor's note: The poem is usually printed in modern anthologies as seen above. 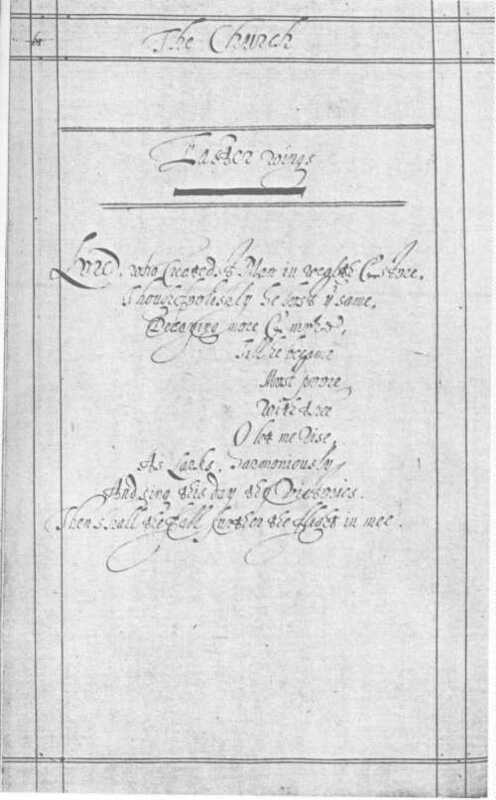 In the 1633 edition. 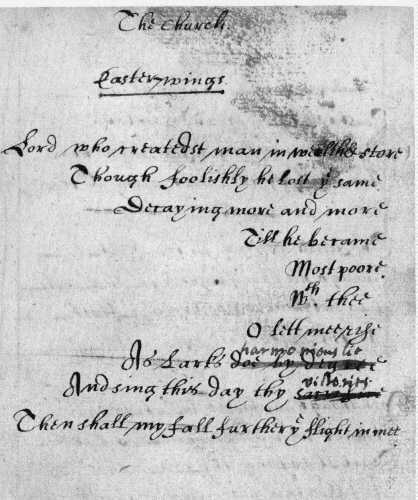 the poem is printed as seen in the scanned copy below, making it look more like its title. 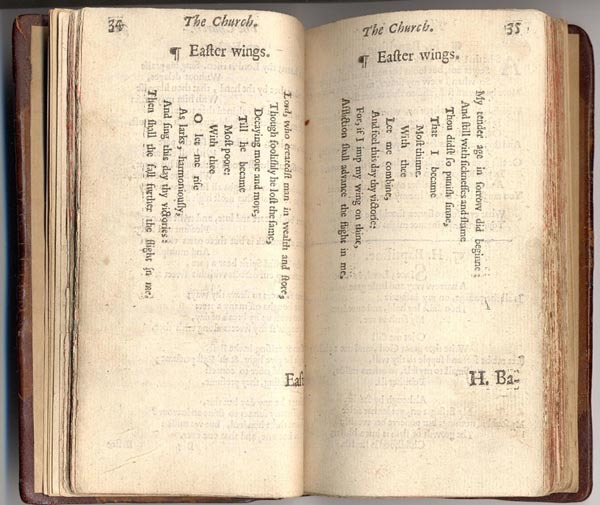 Mr. Dryden hints at this obsolete kind of Wit [shaped poems] in one of the following Verses in his Mac Fleckno; which an English Reader cannot understand, who does not know that there are those little Poems abovementioned in the Shape of Wings and Altars. And torture one poor Word a thousand Ways. This Fashion of false Wit was revived by several Poets of the last Age, and in particular may be met with among Mr. Herbert's Poems; . . . .
Art Student's Addenda: This is the difference between Baroque and Classical Art. Baroque art is famous for its ornaments, but details support the concept of the work in Classical Art. Music Student's Coda: The history of music classes Bach as baroque, but his "ornaments" advance and echo the message of the piece and hold the entire work together. As Albert Schweitzer shows concerning the Preludes for Organ. In this way Bach was closer to the Classic Period than most give him credit. Affliction shall advance the flight on me." Ifeel that this poem is saying that you can't just "create" someone then leave them on their own to grow. They will not grow into a strong person with good qualities. A person needs nurturing, love, and support before they can take "flight" on their own. the last line says this more directly, if he puts his wing just over the other persons then their strenght will push him to be strong and begin his own flight. The reference to the Lord's creation of man is only symbolic, I feel that he is speaking indirectly about parenting and society's affect on a person. 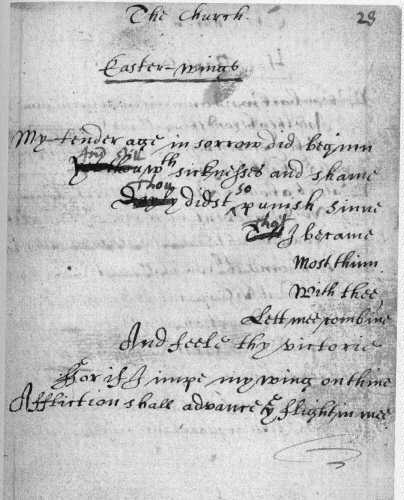 I do not understand what the last line ("Affliction shall advance the flight on me") is saying. How does affliction fit into it? Why is the reference to the Lord's creation only symbolic?? Knowing Herbert, it was probably strictly about religion. i think affliction means like friction, when the one wing moves and begins flight the other will recieve the initial push to do the same. I felt that he was talking about man and the creation. I thought he was saying that God created man and gave man everything, yet man "foolishly" lost what he gave and became more and more corrupt. The poet is asking for God to let him sing the Lord's praises and by so doing he will fall in the sight of others and this fall will enable him to be closer to God. Shannon why does he use 'fall'??? That sounds so counterproductive , when he's wanting to fly. Correct me if I am wrong,however, if we look at the title, maybe THIS poem reflects the second coming of Christ - didn't that happen on Easter - or does easter refer to something else? Affliction seems to mean some sort of punishment in this passage. It advancing the flight in me refers to punishment maybe leading the speaker to do right and therefore advancing his flight to heaven. I thought affliction meant that if he is hurt by others because he is "flying" with God his "flight " will advance or his life will be happier. I think that he is asking God to forgive him for all the wrong things he has done. He is simply wanting to be ackowledge by God and asking for help and strength to change and correct his life, so that he can sing wonderful praises up to God. I'm not really sure except maybe he means fall from the graces of society. Maybe he's thinking that if he follows God he will be persecuted. it seems to be refering to societies tedency to shy away from those that need help the most. when someone looks sickly we don't want to help and that only makes it worse. agood example would be the homeless. Alicia, I think you're onto something. Easter is about the rising of Christ. It coould, in fact be speaking of the second rising of Christ. What is the deal with the shape of the poem? I think it is to symbolize the wings and the uplifiting flight the guy is about to go on. i feel that in both "redemption" and this poem i failed to see the religious connections/interpretations but what shannon said about this poem and what we discussed in class do make sense. wha does That I became most thinne mean? Jignesh, I think the shape resembles a bird, possibly a dove. A dove is used a lot in the Bible to symbolize some sort of overcoming or redemption, the title does also have the word "wings" in it. I thought the quote "And still with sickness and shame\Thou didst so punish sinne,\That I became\Most thinne" is illustrating God's way of letting people deal with their sins and suffer their consequences regardless of their physical state. looking at your interpretation i think maybe he became thin because sin was punished with sickness and he was sinning by not believing or following? Shannon, I know you asked Alicia, but i think of "thinne" meaning a moral thinness. Obviously the speaker has done some wrongs in order to be punished. I think in his own personal way, he's renewing his vows with God. Easter probably had something to do with it. He says: "My tender age in sorrow did beginne. . .that I became most thinne." He's remembering what part God plays in his life and wants to continue down that path. Shannon: I think it's thin. It's kind of neat the way the poem's shape becomes the narrowest when it says "Most thinne". Do you all think thinne refers to thin or thine? Alicia, Are you saying that before we are born we know God, but when we are born we forget Him? Optional music: Welsh folksong "Rising of the Lark"